This obituary was featured in “The Sunday Magazine”, Volume 7. Dr. Window died suddenly, of heart disease, at his residence at Brighton, on Tuesday, the 5th of March. He had preached as usual on the preceding Sunday. He was widely esteemed as an earnest Evangelical minister, although during recent years his name has not been so prominently before the public as formerly. He was of Baptist parentage; his mother, whose memoir he published, and who was a woman of remarkable piety, was a member of the Baptist Church in London, presided over by the late Rev. Harrington Evans, and afterwards by the Hon. and Rev. Baptist Noel. Mr. Winslow began his ministerial career among the Baptists, and in connection with them the greater part of his life was spent. 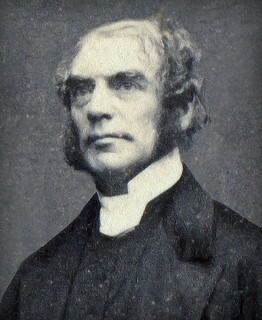 He settled as a pastor atLeamington in 1840, and subsequently laboured for many years at Bath, and finally at Brighton. On his removal to the lastmentioned town, which occurred we believe in 1871, he entered the Established Church, receiving ordination from the Bishop of Chichester. We know nothing of the views and feeling which prompted a step somewhat unusual in the case of one who had already been engaged in the ministry of another communion for thiity years. Dr. Winslow, however, never seems to have laid much stress on denominational distinction, and his career gave evidence that he was in sympathy with the Evangelical spirit and the Evangelical creed, rather than with any special forms of Church organization in connection with which they might be presented. Dr. Winslow has published many little books, which have had a very extensive circulation. Some of them are very felicitous in conception and expression, and are full of Christian tenderness. His little tract called ” Go and tell Jesus” has been a message of comfort and direction to tens of thousands. 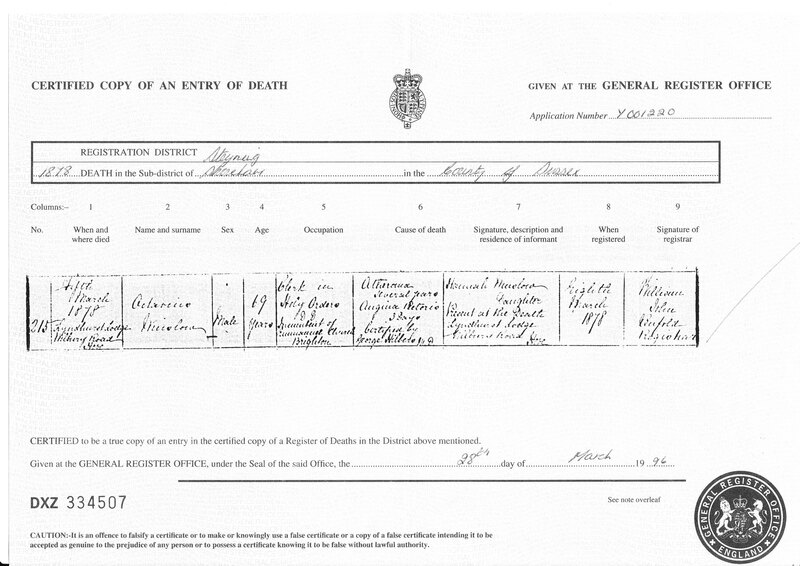 Octavius Winslow died in Brighton on 5 March 1878, aged 69. Here follows part of his obituary in the Brighton Gazette of 7 March: ‘We regret to announce the death of the Rev. Dr. Winslow, the incumbent of Emmanuel Church. This melancholy event took place at the residence of Dr. Winslow early on Tuesday morning. Dr. Winslow had preached to his own church on Sunday, and his death was unexpected. Dr. Winslow was a man who well adorned his sacred office. His unaffected piety, burning eloquence, uprightness, and genial, courteous, benign character, caused him to be respected in life by all who came into contact with him, and loved by those who had closer opportunity of observing his sterling worth. His death will be mourned particularly by the large congregation who Sunday after Sunday were attracted to hear the masterly expositions and the earnest exhortations which were delivered from his pulpit. Generally his loss will be felt by the evangelical party in the Church, to whom his name was a tower of strength. 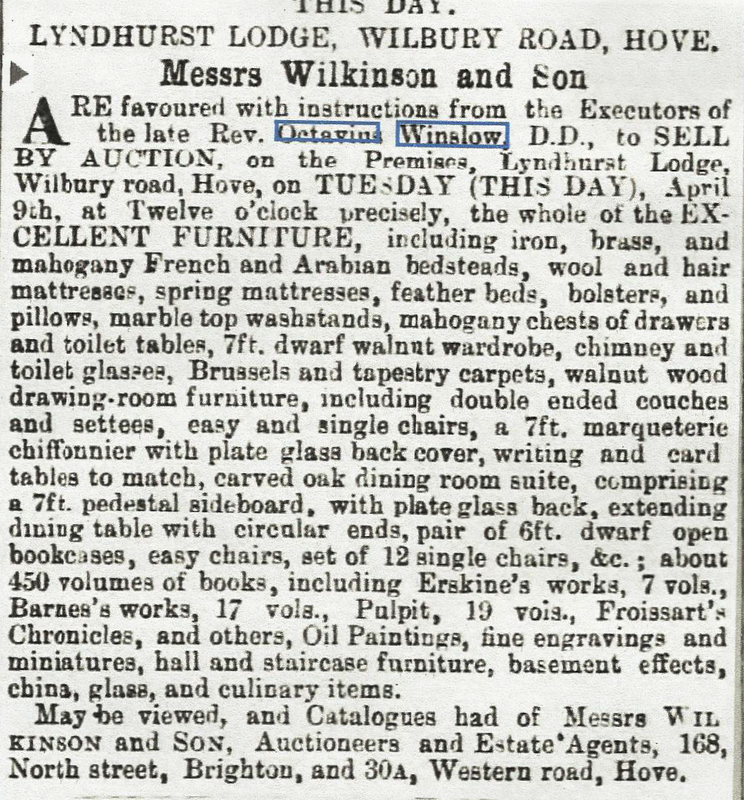 With many thanks to a distant relative of Winslows, below is the newspaper advert published one month after the death of Octavius Winslow concerning his estate auction. As you can see, it appears to be very comprehensive in nature. Towards the end, Winslows last church, Emmanuel Church, was in financial trouble and was in great debt. It appears that Winslow offered his own property as collateral on the loan to either build or improve Emmanuel. After his death, instead of the estate being filtered to relation, it was sold at auction lock stock and barrel. It appears that the contents of the Winslow home were what one would expect to see in many upper middle class homes of the Victorian era. My suspicion is that since Winslow’s financial situation was so dire towards the end, these items were most likely purchased during his more prosperous years, most likely when his published books were in great demand and were selling well at the bookseller. To think about it in that light, it’s actually very sad I think. An entire lifetime of possessions and furnishings that saw the Winslow’s through times of trouble and times of despair and through the raising of several children were sold off to the highest bidder. What’s more, towards the end of the advert we get a tiny glimpse into the personal study space of Octavius in the description of “450 volumes of books”. Not an enormous book collection, but not meager either. To think that these books most likely followed Winslow from ministry to ministry, from church to church, from town to town and in the end were parted away as if they we nothing more than second hand books is heartbreaking. The joys those books must have brought him. The pains they helped assuage. The counsel they once gave. The admonition they once asserted to a man who helped so many. All gone in a hundred directions in one days time. It is nice, however, to see a few tantalizing glimpses into the contents of the library. There were 7 volumes of Erskines Works, 17 volumes of Barnes Works, 19 volumes of Pulpit, and Froissart’s Chronicles (which I believe were only published in French). Perhaps Winslow could speak and read French? Anyway, it’s my job here at the archive to document as much as I can on Winslow, so now, with another small brick to add to the wall of knowledge of the man we have all have come to love, here is the auctioneers advert. It comes from the Sussex Advertiser April 9,1878. Octavius Winslow descended from Edward Winslow, a Pilgrim leader who braved the Atlantic to come to the New World on the Mayflower in 1620. Winslow was ordained as a pastor in 1833 in New York and later moved to England where he became one of the most valued nonconformist ministers of the nineteenth century, largely due to the earnestness of his preaching and the excellence of his prolific experimental calvinistic writings. He held pastorates in New York City,Leamington Spa, Bath, and Brighton. He was also a popular speaker for special occasions, such as the opening of C. H. Spurgeon's Metropolitan Tabernacle in 1861. After a short illness, he died on March 5, 1878, and was buried in Abbey Cemetery, Bath. For a more detailed biography on Winslow, please see our biography page.